We provide technical advice for Pest Control and practical treatments for a range of nuisance pests in residential and commercial properties. 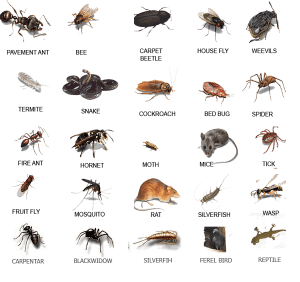 While DIY products can deal with smaller ant problems or with garden ants, a professional pest control service will be required for larger or multiple infestations of ants and particularly if they are the pharaoh ant (Monomorium pharaonis) variety. The likelihood of an infestation of bed bugs is greatly increased in premises with poor, crowded and unhygienic conditions, although it can occur in well maintained premises also. 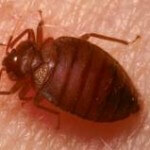 An infestation can be detected and treated at an earlier stage. 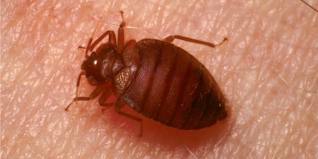 The eggs will be found in beds or mattress seams and the backs of headboards along with dark spots of bed bug excrement. In all cases, and particularly infestations of well-kept premises, it is important to try to locate the source of the infestation. A thorough inspection is needed to determine the extent of the infestation since this affects the control measures needed. The main control measure is the use of insecticide – for example thorough use of a suitable aerosol sprayed onto furniture, room fabrics and other items. Infested clothing and bedding must be laundered (or burnt) and close attention paid to removing fluff, dust and other debris from anywhere which can harbour the pests, for example cracks, seams and around mattress buttons. If the infestation is traced to birds’ nests then the nests will require treating and the building often rendered bird-proof to prevent re-introduction of these pests. 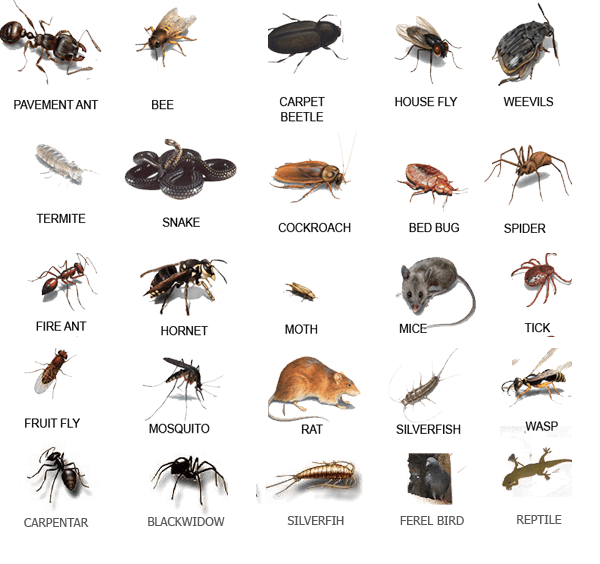 should you wish to know more about these bugs click here. 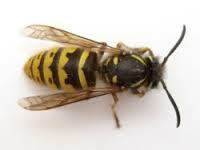 Tackling a wasps nest early in the spring can really help to avoid a serious problem in the height of summer. If the nest is small, on your property and easy to access. If you discovered the nest in early spring and the nest is still small (size of a golf or tennis ball). If there is minimal wasp activity around the nest. If you are NOT allergic to wasp stings. If the nest is within a wall cavity or similar enclosed space it may not be possible to remove it at all. The good news is that the same nest is never reused by a new queen the following year. However a new nest may be built in the same location, if it continues to offer shelter, protection and easy access to the outside. FFM pest control offers a professional call-out wasp nest service to safely treat a wasp nest within your property. There are many types of moths in the home or business, it is important that their correct identification is established as this will affect the prescribed treatment. There are many variety of birds but the one that cause the most problems tend to be pigeons. 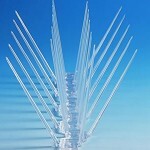 The control of pigeons is a reasonably straightforward process using the bird control products know as spikes (right hand pictured ). 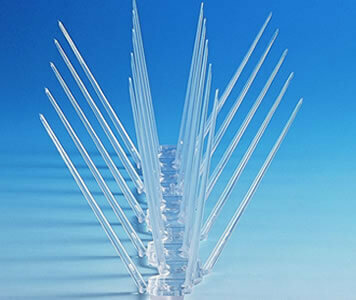 These spikes are easy to fit and are extremely effective, which is the reason why you see them deterring pigeons in your local high street, churches, hotels and other buildings. 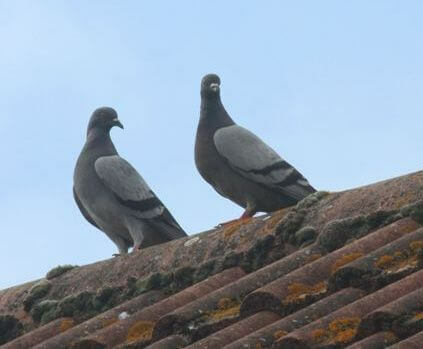 Pigeons are known to cause health issues especially from their droppings. Histoplasmosis is one of the diseases, this is a respiratory disease that may be fatal. It results from a fungus growing in dried bird droppings. Bird netting and pigeon netting is normally made of nylon and used extensively as a bird exclusion device to protect both buildings and agricultural crops. The netting can be seen on buildings in towns and cities all around the world where it is used to deter pigeons. Farmers also use bird netting to protect their valuable fruit crops by wild birds. 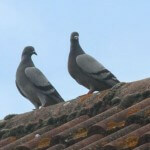 The main reason for using the pigeon nets in a city environment is for the protection of buildings. With regards to some buildings it is essential for the netting to blend in with the fascia of the building and maintain the aesthetic quality of the building. In agricultural environments bird netting is often the only physical exclusion device available to farmers to protect fruit crops, although in many cases the use of netting will be complimented by bird scaring products such as predator balloons and noise-related devices.